M: Milwaukee’s Lifestyle Magazine, published by the Conley Media Group, unveils a new name. 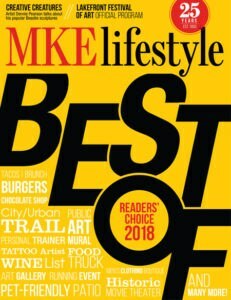 The magazine, M: Milwaukee’s Lifestyle Magazine, also referred to as M Magazine, will be under the new name MKE Lifestyle starting with the June 2018 issue. The magazine will maintain its distinct editorial identity targeted to specific regional interests and will continue to be distributed to more than 63,000 select homes and businesses with upper-end demographics in a four-county area. “Our readers will find that our editorial content will remain familiar. The magazine will continue to support the growth and vitality of greater Milwaukee with its award-winning content on home, health, fashion, dining, culture and events,” Publisher Fran Gimla says of the magazine. The name change coincides with the upcoming 25th anniversary of the publication. Northshore LifeStyle was first introduced in December of 1993, LifeStyle West followed in 1996 and City LifeStyle made its debut in 2000. In 2003 the three publications merged into M Magazine and eventually became M: Milwaukee’s Lifestyle Magazine. Editorial, advertising and production offices continue to be located in Cedarburg Wisconsin. COPYRIGHT 2018 CITY AND REGIONAL MAGAZINE ASSOCIATION. ALL RIGHTS RESERVED.